Half of people prescribed statins are left at high risk of heart disease because the pills fail to lower their cholesterol, a major study suggests. 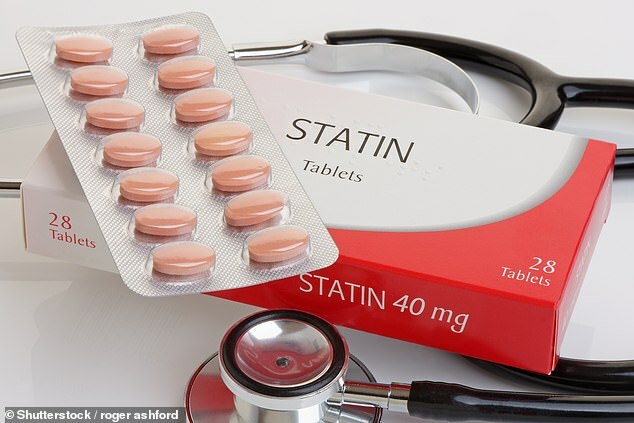 Experts called for a much more tailored approach to the use of statins in the wake of the ‘clearly alarming’ findings. The study of 165,400 people, led by the University of Nottingham, showed 49 per cent of patients given the drugs did not see their cholesterol fall to healthy levels within two years. Researchers believe this may be down to certain people’s genetic make-up rendering the pills ineffective, or it could be that other medications they take interfere with the way statins work. Another theory, however, holds that many people in the study may have simply stopped taking their statins, which is why they did not see an effect. Roughly six million people in Britain take cholesterol-busting statins, preventing 80,000 heart attacks and strokes every year at the cost of roughly £20 a year per patient. The drugs are designed to cut levels of ‘bad’ LDL cholesterol in the blood, reducing furring of the arteries and cutting the risk of heart attacks and strokes. But the new study, which used GP records from patients across the UK, found only half of patients prescribed statins saw the response they expected. The researchers found for 51 per cent of patients statins were incredibly effective – cutting cholesterol by at least 40 per cent within two years. But for the other 49 per cent there was no significant impact. And those patients who did not respond to the pills were 22 per cent more likely to develop cardiovascular disease than those who did. The researchers admitted the data only showed whether each participant was prescribed statins – not whether they actually took it – so they urged patients not to stop taking their medication until there are more definitive findings. But study leader Dr Stephen Weng said: ‘We have to develop better ways to understand differences between patients and how we can tailor more effective treatment for those millions of patients who are simply blanket prescribed statins. ‘Our research has shown that in almost half of patients prescribed statins they are very effective and offer significant protection against cardiovascular disease. The first – high-density lipoprotein (HDL) – carries cholesterol from cells to the liver where it is broken down or passed as waste. This is ‘good cholesterol’. ‘Bad cholesterol’ – low-density lipoprotein (LDL) – carries cholesterol to cells, with excessive amounts then building in the artery walls. A healthy adult’s overall level should be 5mmol/L or less, while their LDL level should be no more than 3mmol/L. An ideal level of HDL is above 1mmol/L. In a linked editorial in the same journal, Dr Márcio Bittencourt of University Hospital Sao Paolo in Brazil wrote that the number of poor responders was ‘clearly alarming’. He said doctors may be to blame for not giving strong enough doses of the drugs. ‘Effective implementation of guidelines among healthcare practitioners and the general population has been a challenge for a long time,’ Dr Bittencourt wrote. ‘Both physicians and patients should be targets for approaches aiming at improving adherence to guidelines.’ Other doctors, however, dismissed the findings. Professor Metin Avkiran, associate medical director at the British Heart Foundation, said: ‘Statins are an important and proven treatment for lowering cholesterol and reducing the risk of a potentially fatal heart attack or stroke. ‘Although this study suggests that not everyone who is prescribed statins manages to reduce their cholesterol sufficiently, it doesn’t explain why. Professor Kevin McConway of the Open University, added: ‘Even if the difference in risks is caused by the difference in response to statins, this research can’t make it clear what should be done about that. Professor Kausik Ray of Imperial College London, said: ‘The only conclusion is that a large portion of people do not achieve guideline-based recommendations. ‘I do not agree this is genetic variation and tests are needed. Statins are the most commonly prescribed drug in the world and an estimated 30 per cent of all adults over the age of 40 are eligible to take them. The cholesterol-lowering drugs are given to people believed to have a 10 per cent or higher risk of developing cardiovascular disease or having a heart attack or stroke within the next 10 years. They are proven to help people who have suffered heart problems in the past, but experts say the thresholds may be too high, meaning benefits are outweighed by side effects for many people. Nearly all men exceed the 10 per cent threshold by age 65, and all women do so by age 70 – regardless of their health. Commonly reported side effects include headache, muscle pain and nausea, and statins can also increase the risk of developing type 2 diabetes, hepatitis, pancreatitis and vision problems or memory loss. Research published in the Pharmaceutical Journal last year found taking a daily statin for five years after a heart attack extends your life by just four days, new research reveals.